A general store in Kilndown was for many years run from the property that stands opposite the Quarry Centre on the corner of Church Road and Rogers Rough Road. 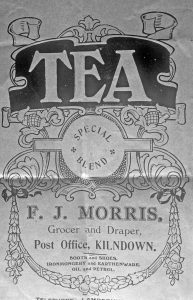 In 1858 Mr Joseph Browning was listed in Melville’s Directory as a Grocer and Draper in Kilndown. Joseph and his wife, Mary Ann, had moved here from Flimwell where he had been a shopkeeper. On the 1841 census 22 year old Joseph is shown as a footman at ‘Great Whiligh Mansion House, Ticehurst’. The 1901 census shows William as a shopkeeper living with his wife, Lily, and their month old baby, Albert. By 1911 William is shown as a Grocer and Postmaster and he and Lily have two servants, Elizabeth Hodge aged 16 and Elizabeth Grigsby aged 15, living with them and their son Albert. 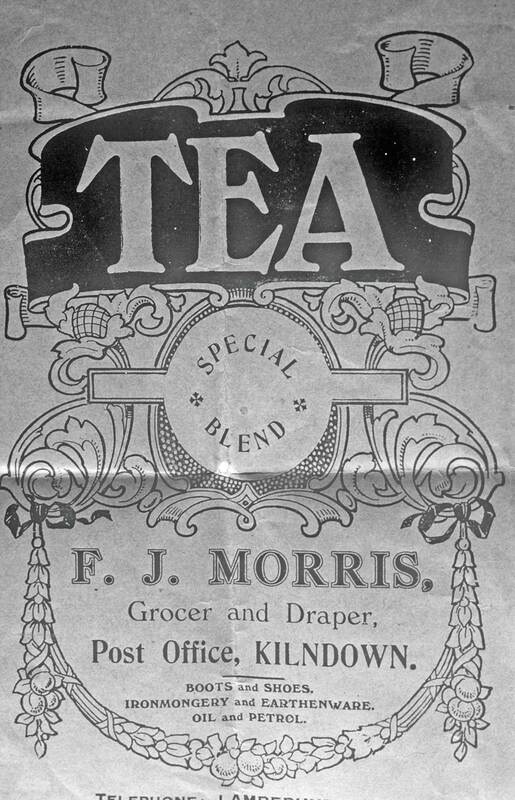 he was de-mobbed, he returned to Kilndown to work for Mr Morris. By now he had a wife and young son. When his second son was born in late 1947 Sam left the shop to work in the building trade where he could earn higher pay. Frederick James Morris died in February 1959. He had been living at Down House in the village. In 1976 the death was recorded of Cyril David Hope, sub-postmaster and shopkeeper at Kilndown. In 1979 the shop was closed and along with it the doctor’s surgery which had been held in a small building at the back of the property. Following the closure of the shop the residents at Kilndown joined together to run a post office and a community store from The Quarry Centre, a building across the road from the shop. 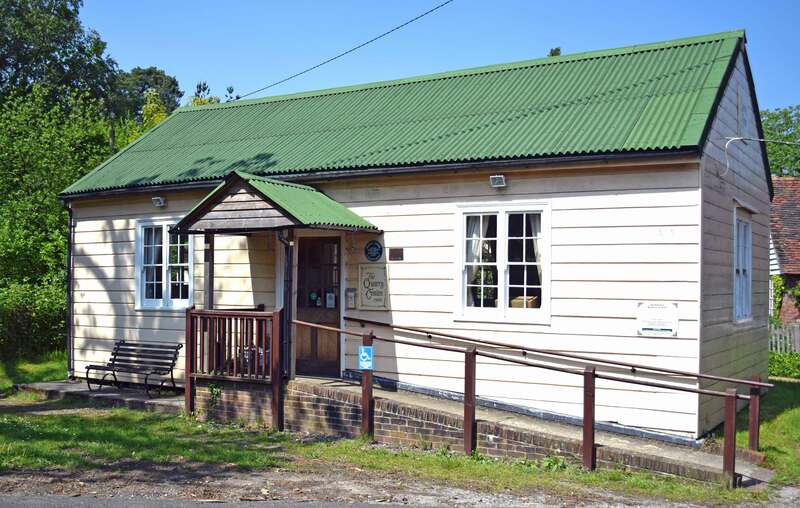 A doctors’ surgery was also held there for many years but has now come to an end. James Robert Smith, “fish purveyor and grocer” of 2 Shernfold Cottage, bought the Wesleyan Chapel for the sum of £300 in 1960 when it closed. He made an application for the change of use to a retail shop and permission was finally granted in November 1960. He had also purchased a small piece of land next to the chapel that he planned to use for parking and loading of vehicles. Mr Smith and his wife, Hazel, had previously been running a small general store at Lamberhurst where they had established a van round delivering all manner of things; general groceries, meats, cheeses, fruit and vegetables, flowers, fresh fish, haberdashery and hardware. The chapel was initially used for storage of goods but a shop gradually developed. The pews and furnishings were removed to make way for shelving, a shop counter and four refrigerators. James Smith ran his business from the old chapel until he died in 1967. Mrs Smith carried on with the help of her son James and her daughter Hazel, until July 1970 when the business was sold to a family from Horsmonden. The new owners kept it going for a couple of years and then sold the chapel to developers. It was converted to a dwelling house in 1973. Charles Stanbridge worked for over forty years as a joiner and carpenter at Bedgebury. In 1855 he married Emma Crump in Sidcup and in around 1866 the family moved to Church Farm. The farm building originally consisted of two dwellings and a granary and Charles and Emma occupied the dwelling next to the granary. Mr Moore lived in the other dwelling for a good many years. In time the Beresford Hopes turned the granary into living accommodation extending Charles’ home in the process. Then the Beresford Hopes added the shop to the cottage and Charles opened a butcher’s business. His son, Frederick, ran the business with some help from his father. An entry in Kelly’s Directory of 1882 lists Charles Stanbridge as a butcher in Kilndown. The business succeeded with orders for meat from Bedgebury when the Beresford Hopes were in residence, and from local villagers. But, with the decline of Bedgebury and competition from other butchers in the surrounding area, business took a downturn and the shop closed down in about 1900. Frederick went to work for Charles Prickett’s butcher’s shop at Lamberhurst, eventually moving there. Brothers Frank and David Southon in turn tried to make a go of the butcher’s business at the farm but they couldn’t make it pay and only stayed about a year. Charles carried on living at Church Farm until he died in 1918 aged eighty six years. Next came Archer Blinks. Archer was the son of Albert Blinks, who already ran a successful business at Hawkhurst. Archer is listed in Kelly’s Directories in 1924, 1938 and 1939 as a butcher in Kilndown. Archer died in 1949 and the butcher’s business at Church Farm ended. Ebenezer Fillery was the son of Walter Fillery who had been running a successful butcher’s shop at Ticehurst. By 1891 his brother Henry had taken over his father’s shop and Ebenezer was his apprentice. 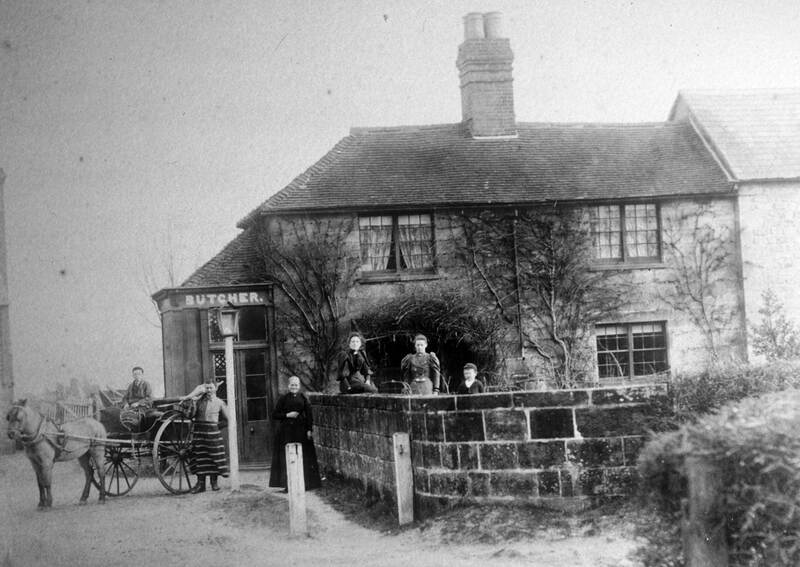 In 1894 Ebenezer married Emily Pope in Ticehurst and he set up his own butcher’s shop in Flimwell. By 1902 Ebenezer and Emily had moved to Summer Hill, Kilndown and their first daughter, Emily Florence was born there. Ebenezer’s slaughterhouse was in a field near the pond next to Summer Hill House. His shop was a wooden building with sawdust on the floor up on the road at Summer Hill Cottages. It is said he used water from the pond to clean the carcasses after slaughter and then carry them up the hill to the shop over his shoulder. On the 1911 census Ebenezer is shown living at Summer Hill with his wife, Emily, and their seven children. The eldest still at home was Walter who was fifteen years old. He was working with his father until he left to work in a butcher’s in Tonbridge before enlisting in the army in June 1914. Ebenezer Fillery is listed as a butcher in Kilndown in the Kelly’s Directories between 1903 and 1938. In 1917 his wife Emily died and the following year he married Florence Francis. Ebenezer died in 1946. As you would expect, in the 1800s and early 1900s people ran small businesses from their homes or from sheds or shacks around the village. Edward ‘Ned’ Blunt ran a boot and shoemaking business from his cottage opposite the Globe and Rainbow. Ned was born in Horsmonden in 1818 where he later worked as a cordwainer. He married Martha Field in 1842 and they moved to their cottage in Kilndown. By 1851 they had three children, and Ned’s 16 year old brother Joseph was living and working with him. On the 1861 census Ned is shown as a shoe and bootmaker. He and Martha had 5 children by then but his brother Joseph had moved on. The 1871 census shows Henry Williams was working with Ned and lodging at his cottage. Ned lived in Kilndown until he died in 1889. On the 1911 census Alfred Drake of Shearnfold was listed as a bootmaker. Another bootmaker was Charlie Underhill who worked in a shed in his garden at Glen View. The 1861 census shows Walter Edmonds running a grocers and drapers shop ‘near the church’ and employing one man. In the 1880s Mrs Sarah Moore ran a general store selling groceries and bakery items from her home at Shearnfold (formerly known as Moore’s). The Kelly’s directory for 1882 lists Ellen Buss as a shopkeeper. 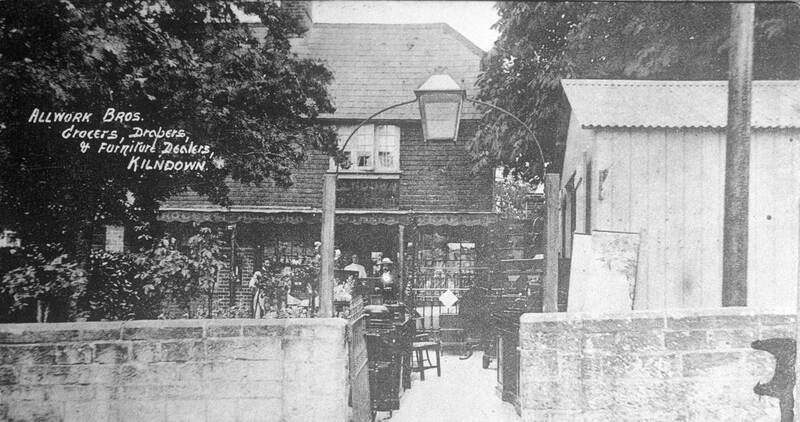 Mrs Buss sold sweets and toys from her home, probably at Whites Cottages. 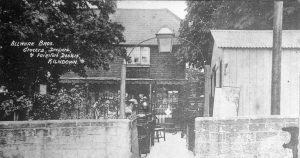 In 1911 Mrs Sarah Fishenden ran a small general shop from the front room of her home at White Cottages and then Mrs Hammond also ran a sweet shop from her home at Whites Cottages. Older Kilndown residents can remember a ladder maker who lived in a cottage at the forge and ran his business from a shed near the quarry where he would also mend bicycles. Sadly none of these businesses exists today and the villagers’ only shop is held once a week in the Quarry Centre and sells mainly local produce.